Google has made the long awaited Pixel 2 and Pixel 2 XL official! Google announced the two successors to last year’s Nexus replacements. This year we’re getting two different manufacturers, HTC for the Pixel 2 and LG for the Pixel 2 XL, and two different designs. We also lose the headphone jack but gain stereo speakers. The two devices share most of their specs. They have a Snapdragon 835 processor, 4GB of RAM, a choice of 64 or 128GB of storage, a 12.2MP rear camera with an f/1.8 aperture and optical image stabilization, stereo front-facing speakers, IP67 water resistance, Active Edge squeezing, and of course, Android Oreo. 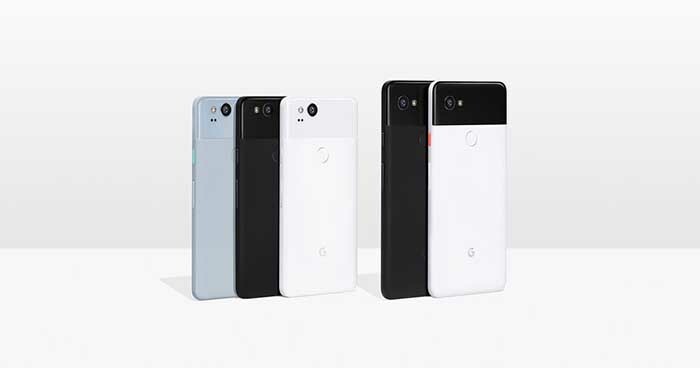 The Pixel 2 features a 5-inch 1080p AMOLED display with a 16:9 ratio and 2.5D glass, a 2,700 mAh battery, and Just Black, Clearly White, and Kinda Blue color options. The Pixel 2 XL features a 6-inch pOLED display with an 18:9 screen ratio, a 2880×1440 resolution, and 3D glass, a 3,520 mAh battery, and it will come in Just Black and Black and White. Some new features include always listening and displaying the playing music on your lockscreen, Google Lens searching via photos, and squeezing the sides of the device to launch Google Assistant. The Pixel 2 is $649/$748 for the 64GB/128GB models and the Pixel 2 XL is $849/$949 for the same storage. And if you buy one of these devices before October 19, you can get the new Google Home Mini from Google for free. If you want to pick one up, head to the Google Store to pre-order!